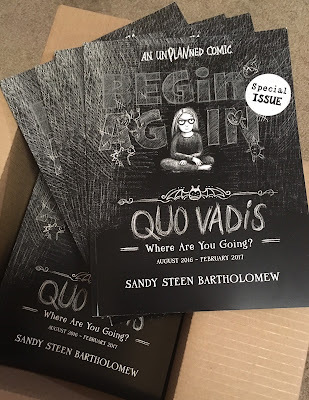 After two successful Kickstarter campaigns to fund her Masters in Applied Cartooning at the Center for Cartoon Studies in White River Junction, VT - local illustrator Sandy Steen Bartholomew is using crowd-sourcing to print her comics thesis. 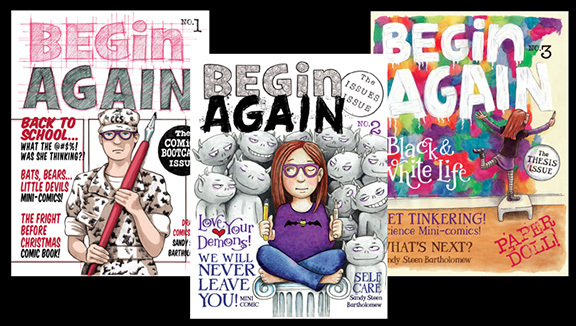 Her thesis project is a series of auto-bio comic "magazines". The first issue - completed, funded, and printed last week - features calendar comics with one comic a day from August 2016 through February 2017. The second part of the project is in the finishing stages now - with only a day left on the Kickstarter campaign! These three issues each have mini-comics inserted in them. All the comics are being printed by R.C. Brayshaw's (in Warner and West Lebanon), in a limited edition of 60 copies each.